JBL Pulse 2 is an interactive speaker with amplifying impact on both music and lighting. It features ten different built-in light themes, ranging from a cosy bonfire or starry night sky to a nature scene or a cityscape, with different ways to interact. The Pulse 2 system automatically adjusts the light activity based on the background sound in the environment and may even capture and match it to the colours of surrounding objects. 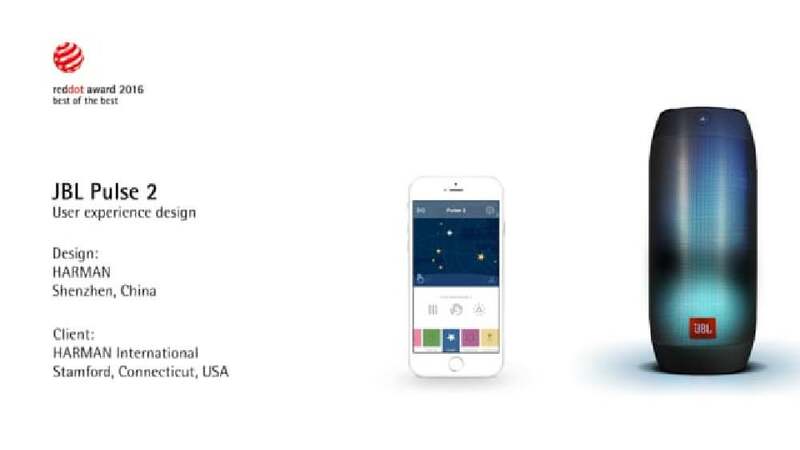 The light themes on nearby speakers can easily be synchronised by simply shaking the speaker, while the innovative JBL Connect app allows interacting with the lighting effects on the Pulse 2 speaker. In addition, ten different animations allow the controlling of other light themes on the speaker, and it is possible to tap, draw or swipe to trigger different effects shown on both the speaker and the app. Last but not least, available for download are ambient sounds designed to enhance ­spe­cific light themes. Together with the app, the JBL Pulse 2 thus allows the visualisation of one’s music, the creation of one’s own light themes and the social interaction with other JBL Pulse 2 users. The outstanding cylindrical sound box in the form of a can translates acoustic signals into a visual experience of high sensual and emotional appeal. The diversity of the visual effects and the impulses that are being played is not only surprising, turning the sound box into a truly compelling gadget for living rooms, it is also communicated clearly and charmingly on the ­display of a mobile device via app.